A Texas couple may have just made two new friends, all because they accidentally texted the wrong number. Dennis Williams received a text March 19, informing him that someone was having a baby. “Congrats lol but I think someone got the wrong number,” Williams replied. The post and the conversation immediately went viral on Facebook. Why? 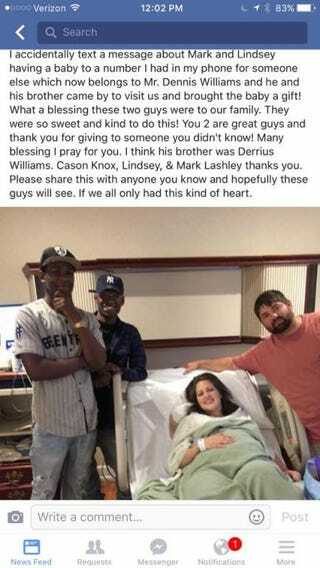 Because Dennis Williams and his brother, Deorick Williams, showed up at the hospital with gifts for the couple. The new parents on the other end of the text had realized their mistake and apologized, but the Williamses insisted on showing up with gifts. Lindsey and Mark Knox celebrated their newborn son, Cason, with the Williamses. And thanked the brothers on Facebook.